This soup is easy to make and a crowd pleaser! Be sure to check your ingredients for gluten-free labeling! Put everything in a big pot. Bring to a boil and then turn heat down and let it simmer for at 15 minutes. This can be simmered for up to an hour. Be sure to check labels on all your ingredients to make sure they are gluten-free! 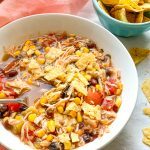 I serve my soup with tortilla chips so if you do be sure to count those points for Weight Watchers or use approved baked chips with Trim Healthy Mama.